The RCZ is the first of a series of limited-series cars from Peugeot. Best bits: The design, which succeeds in creating a stand-alone sports car rather than a modified 308 coupe-cabriolet; also the chassis and suspension, which includes a 23mm widened front structure and unique suspension parts and set-up to provide optimum handling. Target group: Well-educated, successful, trendsetting urban men who are over 25 and have not owned a Peugeot in the past. Peugeot is aiming to boost profits by creating upscale niche models from volume platforms. The sporty RCZ is the first example of the French brand's strategy. The 2+2 coupe, which resembles the Audi TT, is a based on a re-engineered application of the PSA/Peugeot-Citroen's mid-sized platform that also underpins cars such as the 308 compact hatchback and Citroen C4. The RCZ is built by Magna Steyr in Austria. The unit of Canada's Magna International Inc. contributed to engineering the car and won the production contract from rival contract manufacturers Heuliez of France, Finland's Valmet, Karmann of Germany and Italy's Pininfarina. Both Peugeot and sister brand Citroen are creating near-premium cars as part of a trend by automakers to try to generate extra revenue and higher margins by offering upscale niche models using mass-market platforms. Peugeot decided to focus on exclusive limited-edition models while Citroen is launching the DS range. 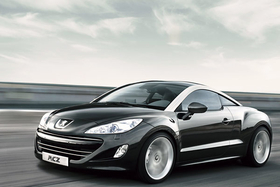 The RCZ is Peugeot's first limited-edition model line. PSA brand boss Jean-Marc Gales told Automotive News Europe last month that Peugeot's second limited-edition car will be a station wagon variant of the single model that will replace the 407 and 607. The new car will debut next year. A third low-volume car is due in 2012, but Gales declined to provide any details. Last month, Citroen launched sales of its first DS car, the DS3, a three-door, more upscale variant of the five-door C3 subcompact. The DS3 will be followed by the DS4 and DS5. The DS name harks back to Citroen's first DS, which was launched in 1955 and became a 20th century automotive icon.